He got a cool cut for warm weather. Photo © NBC | Getty Images. When spring comes into full swing and summer is hot on its heels, many guys start looking for shorter and cooler haircuts for the new season. Ryan Reynolds' Deadpool haircut, a variation of the Ivy League style, is the perfect low-maintenance, spring and summer haircut for men. The style is short, cool, and easy to maintain. You've seen this cut on other famous guys like Channing Tatum and Zayn Malik. It's the cut made famous by dashing young men at Ivy League schools like Harvard and Yale (hence the name). 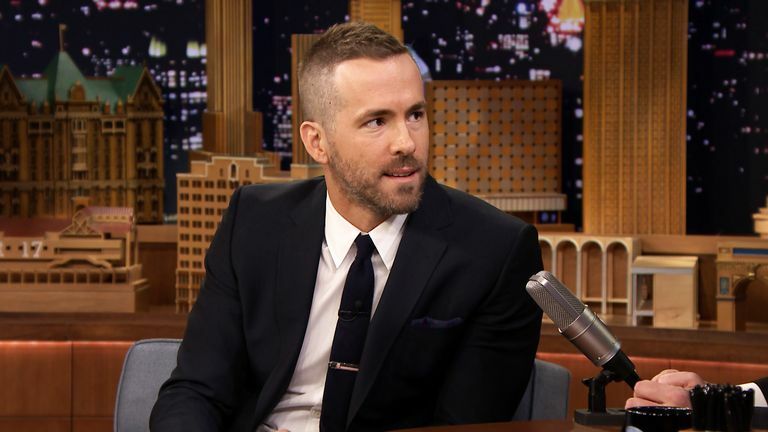 But Reynolds looks almost unrecognizable with this unexpected cut. For years, he seemed to have favored the medium-length, casual hairstyle. For this style, the hair is cut high and tight on the sides and back with a number one blade and blended into about one and a half inches on top, just past the round of the head. The top is cut short with scissors and can be styled with a matte-finish paste to add control and texture. This Ivy League style will work on almost any face shape, but is especially well suited to men with oval or round faces. The high and tight nature of the cut can help balance out a rounder face as the cut is more square in shape. As a rule of thumb, if you want to provide balance, a round face requires a leaner, squared-up haircut, while a square face requires something a bit fuller. Guys with a more square face who still want an ultra-short cut could go with a more traditional style buzzcut. This cut can also work well for most hair types. For those with very thick, straight hair, some modifications may be required to prevent the top from looking messy and unstyled. Choosing the right styling product that will mold the hair into the style you want without looking crunchy is key. A flattop is also a good alternative. To get this haircut, stop by a traditional barber—barbers are typically more skilled with shorter, clipper-based haircuts (and, as a bonus, they tend to be cheaper as well). To avoid all guesswork, print out a photo of the look you want or pull it up on your cellphone and take it with you. In case you forget, you can always tell them you'd like a high and tight cut with a number one blade on the sides and back (traditional high and tights are bald on the sides and back) and finger-length on top. You'll also want to pick up a good matte finish styling paste. Your barber should be able to recommend one, but you can also find them at the drugstore or local beauty store. Since the hair is so short, you'll only need a small amount to create the hold and texture you need. Just warm it up in your finger tips and apply sparingly. You can build up the hold as you go, styling the hair into the shape you want it.